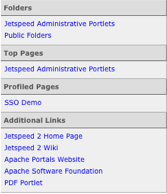 If you are running Jetspeed locally on your computer, you may access the portal by pointing your internet Web browser to http://localhost:8080. The screenshots used for this guide were generated from Jetspeed 2.1.3 without any extra customization. Your screen may vary depending upon the user you login as or if you are using a customized version of jetspeed. You may be using this guide as a supplement to accessing Jetspeed on the internet. Enter the URL to the portal to begin following along with this guide. 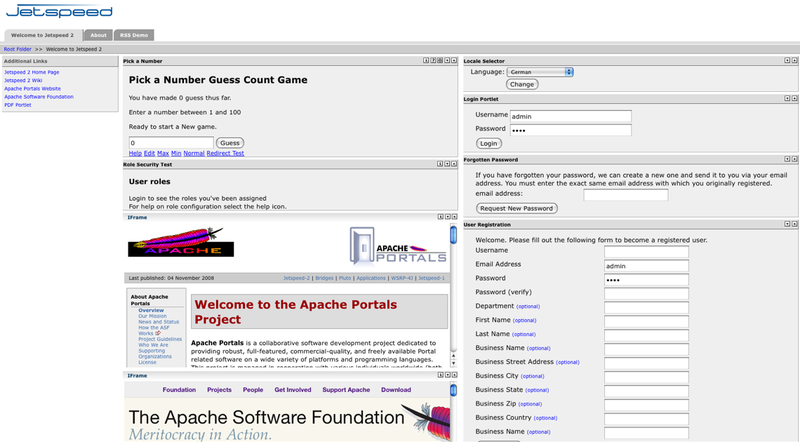 When you are done reading this page, login via the Login Portlet to begin using Jetspeed. The first screen you come across has several portlets to get you started. Each Portlet has a title bar to identify it by name. These portlets can be minimized, maximized, moved to different locations or removed, which we will be covering in this guide. Locale Selector Portlet allows you to select the language you wish the portal to be be using. Forgotten Password allows a user to request a new password in case the current password is lost or forgotten. Jetspeed will email a new password to the email address entered, provided it can match that address with a registered user in the Jetspeed user database. 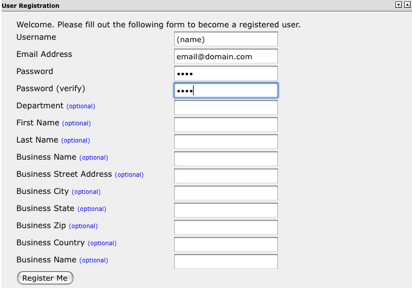 User Registration is your first step if you have not been provided with a username and password from an administrator. The username and email address must be unique for each user in the Jetspeed user database. Jetspeed uses "templates" to create default pages for users when the user first registers or is created by an Administrator. Create a new user in the User registration portlet by filling in the required fields of username, address, password and password confirm Click on the register me button and you have created a user ready to login to Jetspeed. Login Portlet is your access to your private secure area within Jetspeed. Any changes you make to your settings while you are logged in will only affect you. Once you are logged in, you will also see a change password link become available. Change the username in the Login Portlet to the username you just registered. Enter your case sensitive password and press the Login button. The screen will reload and you will now be in your private secure area of Jetspeed. Jetspeed has different views for different users and different views for different roles. The screenshots below illustrate the way the menu's change based on the authenticated user or role.